Following the Sunday evening presentation, Letters to Doris, there will be a “Learning to Give” Community Brunch at the Scout Hut on Monday morning. No registration is needed and all are welcome for this free event (attendance of the Sunday event is not a requirement). 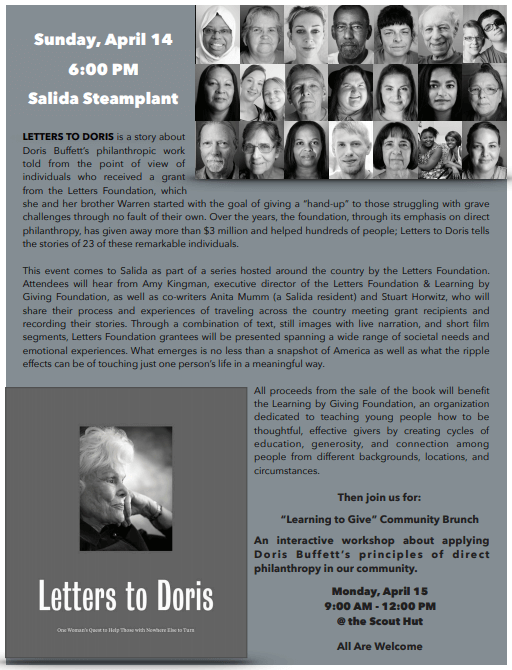 Come learn from Amy Kingman and other key figures of the Letters Foundation about applying direct philanthropy in our home community. This will be a creative, interactive endeavor with brainstorming, discussion, and Q&A.